After a few minutes of everyone reading aloud, TR library services assistant director Danelle Toups briefly spoke to the room to inform everyone what was going on. 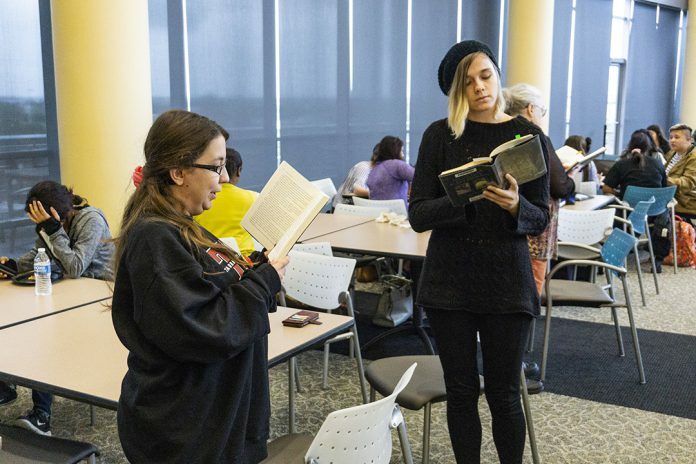 TR library services director Susan Smith was “thrilled” with the number of volunteers that came out to support the freedom to read because it was their first time to do such a demonstration. “We were a little unsure because you can’t sort of put up a big sign saying ‘Hey, there’s going to be a flash mob here this week’ because it kind of ruins the impact,” she said. Faculty, students and staff in the cafe for lunch were initially unaware of what was taking place. Reading aloud got the attention of enterprise project manager Barb Hester who said she was surprised to see Dr. Seuss’ classic book Green Eggs and Ham has been banned or challenged before.